Many enterprise storage systems include two or more types of hard disk drives, with data automatically moved between those two tiers of storage. The same concept has now been applied to two types of SSDs. Dell has modified the auto-tiering software for its Compellent line of large-scale storage arrays to automatically move data from SLC (single-level cell) solid-state disks to those made with MLC (multilevel cell) technology. It will introduce the new capability in Compellent Storage Center, Version 6.4. The software will work with a higher capacity SLC drive and Compellent's first MLC drives, which will ship in the third quarter. The upcoming offerings were announced Wednesday at the Dell Enterprise Forum in San Jose, California. Enterprises have been adopting SSDs for several years because they can provide faster access to data while taking up less space and power than spinning HDDs. Gartner forecasts that by 2017, 90 percent of all enterprise storage environment will use some form of SSD, up from less than 20 percent in 2012. There are now two types of SSDs coming into enterprises, as vendors are starting to consider MLC flash good enough for business use. MLC drives can pack more data into a given space and are cheaper per bit than SLC, but they can't be filled with new data as quickly or as many times. This creates a situation much like the difference between high-RPM hard drives, which offer more speed at a higher price, and slower "commodity" drives, which are slower and cost less. Many storage platforms can now automatically move data from faster to slower disks depending on how quickly users have to read or write those bits. 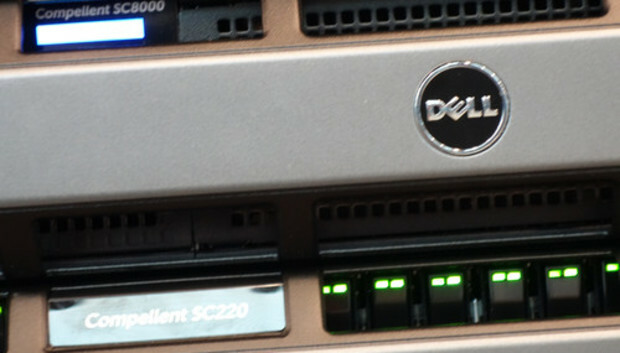 Similarly, Dell's new Compellent Storage Center software will let IT administrators put two tiers of SSDs in a Compellent system and have data automatically moved between them, said Bob Fine, product director for Dell Storage. Though both types of flash storage are now available for enterprises, combining them in the same array is a new practice that isn't really useful unless you can automatically shift data from one type to the other, said Arun Taneja, founder and consulting analyst at Taneja Group. Compellent is in a good position to lead the industry in that direction because it has been a pioneer in auto-tiering software, he said. There are significant differences between SLC and MLC flash, as SLC allows faster writes but costs four or five times as much per bit, according to Taneja. Part of the difference between them is that SLC is designed to withstand far more writes over the life of the product. With auto-tiering, enterprises can take advantage of each type by having applications write to SLC flash when a lot of new data is coming in, then moving that data to MLC drives when it's no longer changing and only needs to be read, Taneja said. However, having two types of flash in the same platform won't lead to a proliferation of all-flash arrays, Taneja said. He believes no more than 20 percent of applications have data needs that are so heavy and constant that they require all-flash storage. In most cases, SLC and MLC flash will become two more tiers within storage platforms that continue to include spinning hard disks, he said. The new auto-tiering software will be introduced along with an SLC drive with higher capacity, moving to 400GB from the 200GB now offered in the line. Compellent's first SSD made with MLC flash will be a 1.6TB unit. Both will fit the standard 2.5-inch HDD form factor. Dell has not disclosed pricing for the SSDs. Compellent Storage Center 6.4 will be a free download for current customers.